From left to right stand Alexis Wothe, Brea Elliot and Gallia Sheriff Matt Champlin. Alexis Wothe and the 4-H club, the K-9 Korps, have been donating resources to area law enforcement, such as the Gallia Sheriff’s Office, in their mission to outfit canine units with protective vests to be utilized in the line of service. 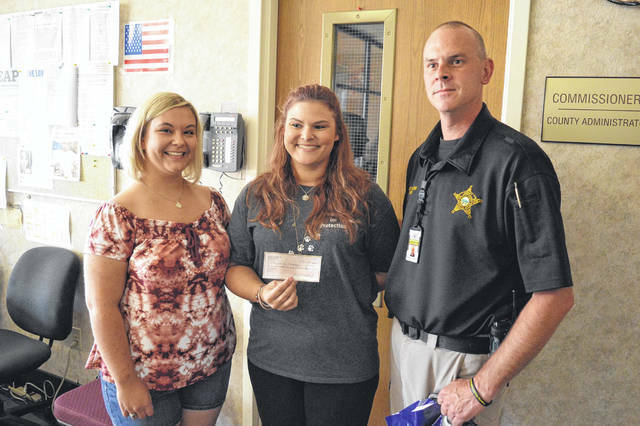 GALLIPOLIS — Alexis Wothe donated money to the K-9 Korps 4-H Club Monday afternoon for the Pennies for Protection program while also passing on some donations to the Gallia Sheriff’s Office. Wothe’s brother works at a women’s correctional facility in Virginia and through that connection she encountered Karen Allen Ballengee, owner of Southern Police Equipment. Ballengee made the donation to Wothe to bring back to Champlin and law enforcement after discussing the mission of Pennies for Protection. Pennies for Protection is a program led by the K-9 Korps in its mission to outfit Gallia police canine units with protective gear and support in the line of duty. Wothe took part in a yard sale for a third year utilizing donated items from across the area and placed a donation jar at a local store Petland to collect around $775 to be put towards the 4-H group’s outfitting efforts. The K-9 Korps recently purchased another vest for canine unit Chan with the sheriff’s office along with a “Buddy Bag,” emergency supplies to support the canine it its mission. Some of the 4-H group’s vest purchases can weigh around 2.5 pounds. They can be flame resistant and consist of 13 layers of Kevlar. These vests have been reported to stop a four-inch stabbing blade, a .44 Magnum, 9mm and .45 slugs. Reportedly, some vests can protect against hollow-point ammunition. Vests can cost over $1,000 at times and have a shelf life, so the group is constantly looking for the latest gear for Gallia’s police dogs. The club said its next dog on the list to be outfitted is Gina with Gallipolis Police Department. Champlin thanked the group for their support, saying that not only are canine units an investment in the county’s safety and protection but that they are often family beside their fellow officers and deserve whatever protection can be found. For more information, visit the Pennies for Protection Facebook page. https://www.mydailytribune.com/wp-content/uploads/sites/42/2018/07/web1_DSC_0451.jpgFrom left to right stand Alexis Wothe, Brea Elliot and Gallia Sheriff Matt Champlin. Alexis Wothe and the 4-H club, the K-9 Korps, have been donating resources to area law enforcement, such as the Gallia Sheriff’s Office, in their mission to outfit canine units with protective vests to be utilized in the line of service.